Earth 14 is under attack by Prophecy and his army. Despite the Justice League of Assassins' valiant attempts to fight them back Prophecy kills them and steals the innate powers of its Superman. Elsewhere, Superman arrives at the Orrery of Worlds and The House of Heroes, a base for the inter-dimensional protectors that is in Bleedspace, a plane of existence that is connected to every dimension. The Justice League Incarnate computer AI, Harbinger springs to life and notifies them that Earth 14 has lost its League and Superman has vanished from it. Red Racer laments that 15 Supermen and women have been taken from the 52 recorded Earths. Superman points out a flaw in the team's action plan. Trying to predict which earth is next has lost them so many Supermen already, instead, he proposes a rescue mission to gather as many of the heroes as they can. A reluctant Super Etrigan on Earth 13 first then 10, 12, 18, 16 they race to rescue as many as can fit on board the Ultima Thule spaceship. They come out of their invisible frequency so Prophecy can detect them and as the villain approaches the heroes teleport away to carry out the next part of the plan. Alone aboard the Ultima Thule Superman whispers a goodbye to Lois and Jon as Prophecy arrives and realizes he's been tricked. He doesn't recognize our Superman but as Clark powers up the Ultima Thule, the lone hero intends to make an introduction. Story - 5: It's moving too fast! I am really enjoying this story and the hundreds of easter eggs in the past two issues alone. I can only find the pace to be a sticking point. Given the expanse of the cash grab Justice League vs. Suicide Squad I can't help but feel we aren't getting enough time on the journey through the multiverse. Or maybe I just long for the days of old when a Superman story arc crossed into Superboy, Steel & Supergirl along with his other books... Multiversity itself was nine issues long. With such a pace I can't connect or care for any of the Supermen despite a real desire to know them - and yes I know I have the internet to look them up, but even after boarding the Ultima Thule none of them even take time to bond. Perhaps as the arc climaxes that is still to come in the final issue. There is one story point I'd like to draw attention to... Prophecy doesn't recognize Superman as a real one like his multiverse counterparts. Is this a precursor to "The Button"?. There has certainly been a long lead in. Peter J. Tomasi & Patrick Gleason have been telling some amazing Superman stories during their run. They are an explosion of creativity and really know fan service. This duo leaves you wanting more Superman and that is never a bad thing! Art - 5: The different artists are isolated to different sequences and to me this is a wise choice. Usually hopping between creative styles is more a headache than an enjoyment but as they have a scene dedicated to a particular look and theme, they make the multiverse all the more diverse and more enticing. 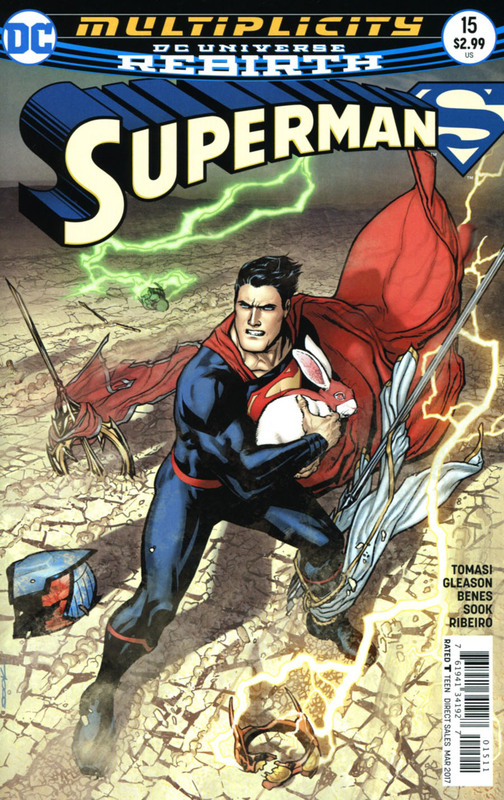 Cover Art - 5: Protect Captain Carrot at all costs! It looks like the Justice League Incarnate have fallen and only Superman still stands. The obstinate look on Clark's face and the unseen relentless foe make for a really cool cover. Ryan Sook really knows how to draw a Superman cover that makes you want to read the book! 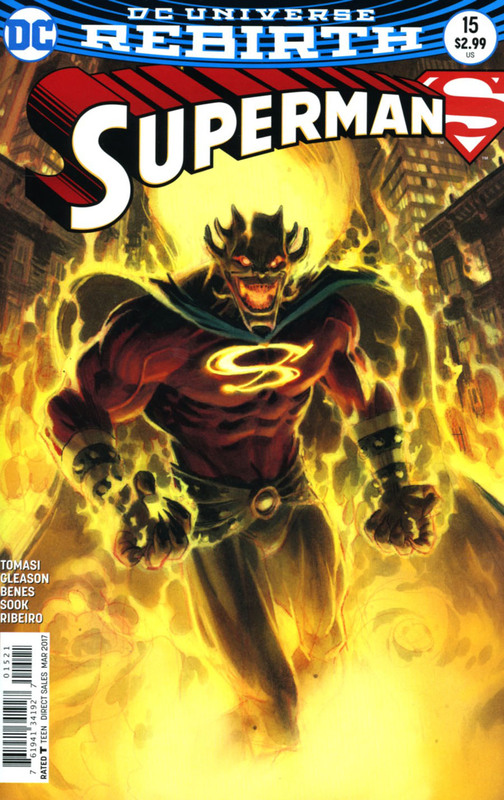 Variant Cover Art - 3: I like this cover showing Etrigan as a piece of art but its relevance to the story is at a minimum. Andrew Robinson delivers the wow factor here and had it been Superman fighting Etrigan proper or the Demon possessing his body then this would have been perfect, but otherwise it's a bit of a misleading variant.